It’s time to remove your Exoray assassinating equipment. You won’t see them around here. 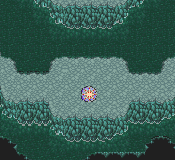 These floors don’t have anything quite as irritating, but they do house one new monster I haven’t quite figured out. The Duelist reacts to either magic or physical attacks. It seems random which he reacts to, and you don’t have much of a chance to figure out which without one or two of your characters being counterattacked with Strong Attack for at least 9,000 points of damage. You do have a slim chance of running into a trio of Soul Eaters. You may want to keep an Artemis Bow or two at the ready. Ignore the stairs in front of you. They don’t lead to any treasure. Instead walk to the east and under that giant waterfall. Sputter a bit and keep walking to the east. Descend the stairs at the end. No treasure in sight yet. Walk to the west and go down some more stairs. Turn east and march some more. Run down the stairs when you notice the treasure chest on the next floor. Open the chest for another Cottage. There is a consecrated circle in your future, so try not to grumble too much. Take the stairs just to the south of you and run up to the treasure chest at the bottom of them with renewed vigor. Use your skeleton key on the lock and marvel at another bit of Advance only finery: the Royal Crown. This gaudy helm raises both your def and mdef by 13. It also increases mpwr by 1 for that added zing to your spellcasting. And it raises your agi by one so you get to land your punches a wee bit quicker. Couple that with a 5% evd and a 10% mevd and you’ve got yourself a pretty good hat. Skip down the next set of stairs and walk west. Ignore the next set of stairs going up to another level. They don’t lead to anything. You’ve plucked all of the treasure from this room. Trudge down the next set of stairs and then walk all the way east. Begin your descent on those stairs. They dump you out onto the next floor. You have more stairs to contend with. Walk forward and down the stairs below you. You are probably wondering what the heck that sparkly thing is in front of the door. You can examine it, but you won’t learn much. “It’s been sealed by powerful magic. Still, the switch to remove the magical barrier must be around here somewhere…” I wasn’t aware magical barriers were removed using switches, but at least you know what to look for. Before we start to look for that switch though, we are off in search of more loot. Walk east and down the stairs. Head west From the treasure room stairs and keep going until you spy a southern passage and—a switch! I know, you are excited, thinking that maybe this is the aforementioned switch that removes the magical barrier from the door. Press it. The waterfall next to it stops for a moment. It doesn’t quite remove the magical barrier you were thinking of. You can still wander through the water and take the Coral Ring out of the chest to the west of it. If you try going north and passing under the waterful (which is so easily accomplished with every other waterfall in this world) you will be forcibly driven back down here. You need to press the switch to stop the water and then Sprint (yes the ability) up and west as quickly as your stubby legs will carry you. It took me a few tries to get through it. Manual dexterity is not my forte else this would be a walkthrough for Mortal Kombat. If you (like me) need a few tries to get your timing right, you may want to give someone the Read Ahead ability, because those Duelists are unforgiving when you whine at them about messing up your sprinting. When you finally make it across, all that is left to do is exit the area into the next cave. There is a consecrated circle close by. If I were you I would be rather desperate for one right about now. Walk north from the entrance and up around the semi-circle. At its zenith is a treasure chest. I guess you have time to pick up one treasure before you save. Open the chest and behold the Longinus. This, um, long, spear is the strongest one in the game. Its 132 atk far surpasses the Dragon Lance’s 119. Granted it doesn’t do anything special unlike the Shinryu killing Dragon Lances, but it does have a nasty point. With the Longinus in your possession it is time to save! Tiptoe north through the door in the middle of the waterfall and behold the majesty of the sparkling circle. You can finally use one of the many Cottages you have collected on you way here. With that done, you have a bit of exploring to do. Back in the Hall of Tranquility proper you can go whichever way you choose, east or west, just go towards the center of the room when you come to the crossroads. At its center awaits another sage. He warns you about some of the nasty beasts awaiting you: “To the left lurks a mechanical beast; to the right, a fearsome dragon. Choose a path, or go beneath, where he who would thrust the world into darkest despair rests. If you truly wish to go forward, you must defeat he who is locked in the dungeons of the Sealed Temple. Defeat him and all barriers to your progress will fall.” So you have another choice to make. You can go take on Omega Mk. II. Or you can trudge back to the Sealed Temple and give the Archeodemon a whirl. My choice for the moment is to go for Archeodemon. If you wander about this room a little more, you will find a strange foggy pulsing thing to the south. Touch it to learn that it is another warp point that has a magical barrier surrounding it. When you defeat Archeodemon the barrier will lift and you will be able to warp to Lethe Court, Enuo’s demesne. You have a bit of a journey in front of you. If you are fed up with random battles, equip the Read Ahead ability to reduce their frequency. Exit this room the way you came in (to the left remember is Omega Mk. II, we’re coming back to him later) and run. The waterfall in B2 will shoot you down to the ground. That’s ok. Get the water out of your ears before you run north and east, up the first set of stairs you see, up the next staircase, and up the final staircase back to B1. At the top of the staircase head west. Run under the wide waterfall. This one is gentler than the one in B2. I promise you can cross it without fear. Get your courage at the next staircase. You have one long climb ahead of you. Go for it! Run up, up, up the stairs until you reach the entrance to B1. Back in the Heart of Ronka you have a slim chance of running into Exorays. If you are worried about them reequip your ribbons and fire-absorbing equipment. Walk up the long corridor and then down the one to the right. Go right at the split in the hallway and pause in front of the chain pulley. You are going to use it to take a shortcut. Hop on and ride down to the warp zone. Take the eastern path. Turn north at the split in the path. A warp point winks from between four statues. That point is why this silly chain playground is called the Warp Zone. Take the warp back to the Sealed Temple. You should probably start by maxing out your jobs in the Interdimensional Rift. Go to the final save point, then quicksave your game, and reload it. Try to run from the first battle, but the second battle will be with the Movers. If you kill them all, you'll get 199ABP. It makes maxing any job easy. After that, you'll want to fight Enuo with a party of Freelancers. Equip all of your characters with Ribbons (this is important because maintaining good status is always a plus) and maybe even Angel Rings. This was my skill setup: Bartz - !Rapid Fire, !Spellblade Lenna - !White, !Time Faris - !Rapid Fire, !Blue Krile - !Black, !Summon Start by casting the blue spell Mighty Guard (learned from the Stingray, you will have to control it to learn it). Follow it up with Hastega. After that, try to obliterate him with all you've got. You'll have plenty of money to buy Elixirs after killing Movers, too. how can u beat euno??? ?